The Association of African Americans in the fire service has pledged to set up a fund to train Zambians in firefighting and other fields of study. 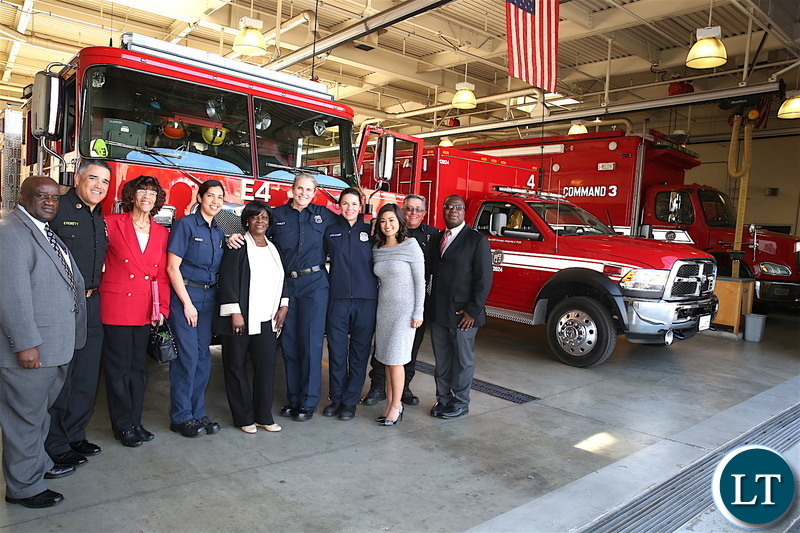 President of the Association, Gerald Durant, announced the development when Zambia’s First Lady Esther Lungu visited fire station number 94 in Los Angeles today. ZANIS reports that Mr Durant said his association is keen to establish strong linkages between the Los Angeles fire department and the Zambia fire rescue services to facilitate capacity building among firefighters in Zambia. He said the focus of the association also known as Stentorians is to impart skills to Zambian firefighters so that they can operate and handle new fire engines that will soon be delivered to Zambia as a gesture of goodwill from the Los Angeles Lusaka Sister City Committee. “We are most interested in making sure that we have members from Zambia to come and train with us, and we would love to come to Zambia to train people there as well. We want to make sure that we hand over, give and help them improve with knowledge and skills and improve their abilities to perform as firefighters,” said Mr. Durant. 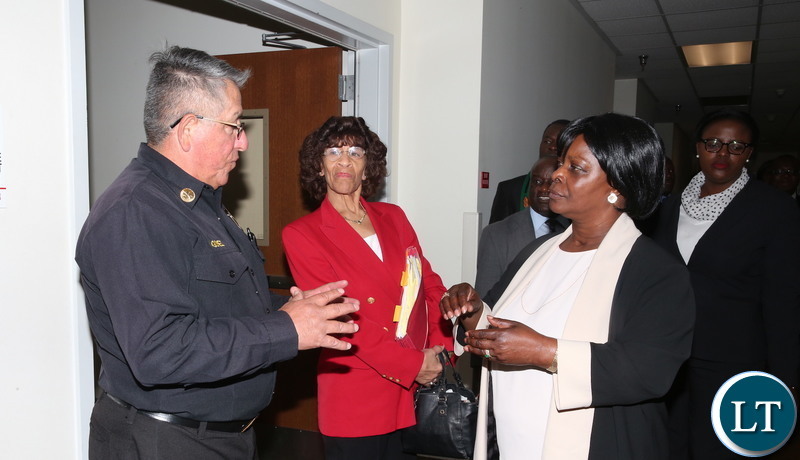 Meanwhile, Assistant Chief at the Los Angeles Fire Department, Kwame Cooper, has called on Zambians to take advantage of the scholarship that will soon be made available to further their education in order to better serve communities in which they live. Mr. Cooper, who briefed Mrs Lungu about other countries in the world that have benefited from the associations support in education, said the organization will be glad to include Zambians in future scholarships. “We have had firefighters from Ghana, Barbados and we would like to expand that by asking firefighters from Zambia, please come to our institute and we can help with scholarships, we think that it is critically important that we share all the information that we learn about leadership, about management about public education for the one sole purpose of better serving the community that we are responsible for,” he said. The First Lady, Esther Lungu, expressed gratitude to the association for the offer to finance the training of Zambians in firefighting and other areas of learning. Mrs Lungu said the gesture was a demonstration of love from the people of Los Angeles to their brothers and sisters in Zambia. This was expected from cynics, every move is seen in reverse. If you ask those without a vision what they have contributed to their country, chances are that they will not even have helped to dig a pit Latrin in their own village. The most dull people claim to know everything and yet know nothing. Did she need to go with 25 people on a tax payers bill to receive the fire engines? The lazy old hen, in her old lazy age doing a sit feeler’s job. This could have been done by two people not twenty fine for God’s sake .What a useless and clueless government . Where are the 25 personnel in Mrs. Lungu’s entourage? Are they ashamed to show them to Americans? Or they’re busy shopping? Do they need 25 pipo x 15 days to receive donated second-hand trucks? What happened with fire in her family? This fire obsession is worrying. What’s all these about? Where will fire come from? The picture tells you we only needed 5 people, if needed more, there are Zambian paid to represent the country in USA. The deal is done in 60 minutes but why at an expense of 25 people and a period of 2 weeks? I asked our colleagues in the states ..what Los Angeles Lusaka Sister City Committee is and who its members are still no response? Why not fight for medical equipment fire thing is not urgent. We are tired of selective evacuation of privileged people and our first lady is busy lobbying for irrelevants.She is reminding us of the $42 million fake fire trucks come back now. Ati way to go ??? You think the trip for 25 on a chartered jet is for free when workers at home are not being paid ??? This is not funny anymore. That a country 54 plus years old can still go to such extents is ludicrous. Maybe it’s just me seeing it this way but then at the very least it is ridiculous. Likely we will be “taught” what we already know. The whole 25 strong entourage doing [email protected] in LA but shopping…if you read the whole article you will see that there was no need for this expensive trip. Everything has already been set up probably by Sampa and Tasila’s visit last 2 months ago…they are all cooking up lies with those poor ZANIS journalist enjoying a rare outing. And Lazy Lungu is more than happy to keep the Old Hen preoccupied am sure he is planning a 2 day working visit somewhere this Friday. Kalok – Clearly your ignorance is very dangerous — you are better sticking to the issue of the size of the delegation and not to try to compare the Los Angeles Fire Fighting capabilities and discipline and the Zambian Fire Fighting capabilities. So this is the trip that needed a 25 member delegation, with bedroom attendants and cooks? ….and a cleaner while the 6 star hotel has cleaners.. Laughable headline…in what capacity is old hen Ester negotiating this…we would have thousands paying for two LA firefighters to come to Zambia and handover this. The whole first lady on a silly mission which could have been headed by some one in the Ministry of Local Government or the council! Now we have a Los Angeles fire officer putting his hand around the shoulders of the first lady! Makes you wanna puke! He knows he is talking to a dullard the moment she opened her mouth..
Left hand drive. Are they coming with spares like ambulances? Anyway they are for free. They might be for free , but if the add in the money for the 25 man esther lungu commission , you find you have spent more…. The trip was not cheap! The entourage is way bloated and cannot be justified! The duration of the mission is too long for the reason it was undertaken. These clowns should not pull wool over our eyes when they abuse our resources and take trips with little benefit to the nation. @Kelvin Mulanga you are spot on. UPND danderheads and sycophants are Sadists who will never appreciate anything unless it’s done by their Supreme leader HH of the UPND who has hidden the privatisation loot in the paradise papers all because of group think mentality. Where is the logic of sending a 25 man team ,chatering a jet to go and look at 2nd hand fire trucks ?? 2 to 3 people could have done this …..
Doesnt State House find some of these things embarrassing?Is this not a trip which should have been left to council workers in the Fire Department?A whole first lady on such a useless trip,and it will take 15 days,God help them.Whoever sanctioned this trip together with the beneficiaries must one day account for wasting tax revenue.Honestly with the way taxes are literally killing us someone with his eyes wide open came up with the idea of having this trip.And we are supposed to be under austerity measures. The first lady,with due respect, should not make negotiations on behalf of the government. It conflicts with the duties which she is supposed to do appertaining to her office. Unless we design her office as a constitution office. As it is the job of negotiation, is ultra vires. That should be left to constitutional offices like ministers and permanent secretaries. We need to define the roles of the office of first lady so that it does not conflict with constitutional offices. First ladies are not supposed to do deals and negotiation processes on behalf of the government. That is one way of jumping the line on which that office was created. Our first lady should be advised on the line she should tow.This is a recipe for corruption. This could have been done by two people not twenty five for God’s sake .What a useless and clueless government this is .The other twenty three people not in the picture had gone shopping using Chinese kaloba . Some comments above clearly indicates lack of understanding on the role of the first lady. Good job madam first lady may God conyinue to bless you. What is the role of the first lady? Yes ZAMBIAN FK tell us the role of the 1st lady ??? Which understanding naimwe ubupuba bweka bweka…..do you understand the the terms need and necessity…. For some of you who do not know the first Lady is actually a qualified fire truck inspector with a PHD in Fire inspections. The 25 member of her team had actually undergone some training as assistant fire inspectors, those trucks had to be properly scrutinised before they are allowed on our high grade built Chinese roads. I can deduce that the pressure to buy fire trucks came from the bedroom. Therefore, cadres may have been hired to cause fires to justify the procurement of the fire trucks. Part of the Puzzle solved! The burning of City market, dramatic response from Government that followed and how the situation has been handled rises more questions than answers. Laughable indeed Donated fire trucks/ engines looking newer than the ones we bought at those exorbitant prices. Did we need all that delegation including a maid and kitchen woman. In a 5star hotel you dont need maids and house/ garden boys. Did she go there to stay or what?????? No fire hydrants and every place in Lusaka is blocked by street traders . Most city roads are impassable and accessing burning homes is near impossible bcoz they’re not planned compounds. Zambia needs to get off the dependence syndrome. Zambian problems need Zambian solutions. I am in san diego ( 2 hrs from la), fire fighters here perform very different tasks than in Zambia, even the fires they fight here, are different, the buildings are different, the landscape and terrain is different. buildings here are made with different material than in Zambia. Zambian buildings are made using concrete blocks which can withstand fires whereas here they are made of wood and they easily burn…a few months ago we had massive fires in many parts of ca due to drought ..what I am saying is that, while knowledge sharing is important, the skill set required is very different between the two. Even those massive LHD trucks will not fit onto our roads…. I see the First Lady’s trip as more than just receiving fire tenders, rather I see it in building bridges and setting invaluable links. The people who invited her see it that way too. On another note, these fire tenders are left hand drive aren’t they? Uuhhhmm. Just opening up the debate for trib.als, who need help with original thinking like myself. The fact that they are 2nd hand is secondary iwe koswe….we are debating sending 25 people in a chartered jet to do something 3 people could have done…. Are we expecting more fire or what? That is right….those massive LHD engines will only be able to squeeze through Cairo road….taking both lanes.